There has been a lot of recent press about bankruptcies, reinforcing the idea that loans to restaurants are a risky business. 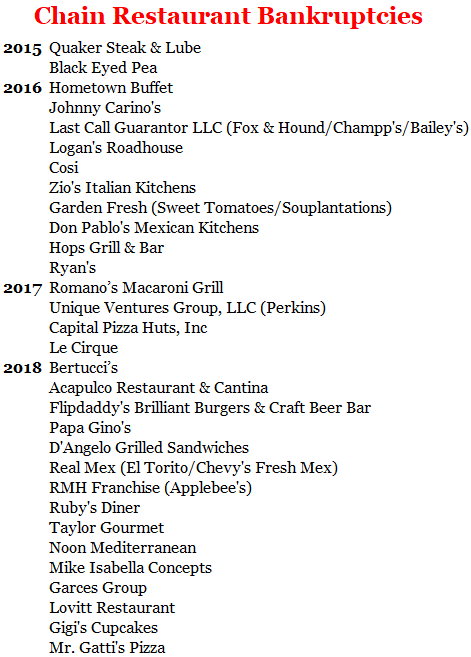 However, a quick look at a list of bankruptcies of restaurant chains over the last couple of years (below) reveals that while bankruptcies have clearly ramped-up in 2018, it is mostly the smaller chains that have been the victims. 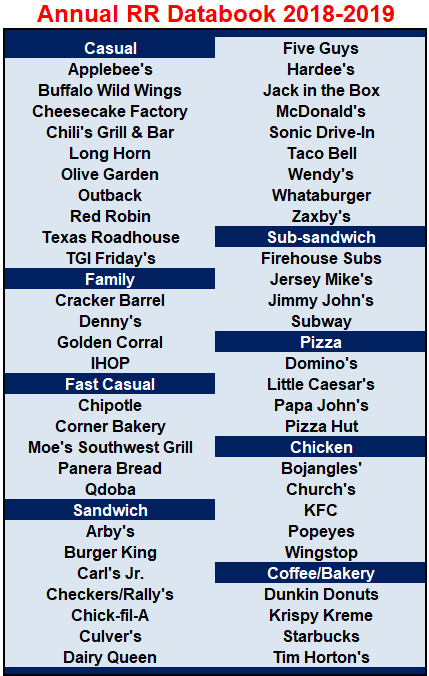 The larger, national bands are nowhere to be found on the list although a couple of larger franchisees were included. Still just 2 franchisees of national brands during this time is not bad by any account. This suggests that smaller players are vulnerable to the marketing & pricing advantages provided by national scale in a hyper-competitive market. Notably, the ramp-up in franchise royalty securitizations (~$17B outstanding currently) suggests that institutional investors are not shying away from lending to the national brands despite these bankruptcy headlines. 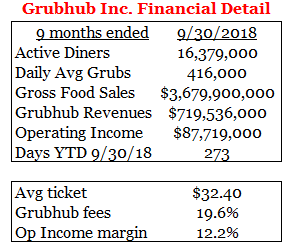 3rd party delivery is clearly gaining share in the restaurant industry, with Grubhub generating $3.7B of gross sales during the YTD period through 3Q18. The surprising stat below is that Grubhub's average ticket is north of $32 (including fees which boost actual food costs by close to +20%). How does delivery of low ticket coffee and QSR burger orders fit into this model? 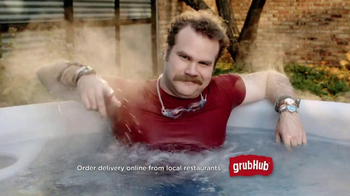 In any case, it is notable that with Grubhub's operating margin of just over 12% there is probably not much room for restaurants to negotiate lower fees. Also, this suggests that there is probably not much appetite from Grubhub to pursue a lower ticket business which is especially unprofitable for its drivers who work for tips. Restaurant brands have known for some time that declining TV viewership (especially among the younger generation) renders traditional TV advertising less effective. In the chart below, we see a well telegraphed decline in total marketing spend as chains substitute increasingly expensive TV ads (especially as measured by cost per effectiveness) for relatively cheap forms of social media marketing. Notably, the 2018 slowdown can mostly be attributed to McDonald’s & Subway. Restaurant chains plan to offset their declining TV marketing spend with a rise in social media marketing. However, the chart below indicates a slowing rate of growth for restaurant chain followers, reflecting an increasingly high level of penetration. Now it is up to the brands to learn to convert followers into traffic. Dunkin's famous coffee, donuts & munchkins are legendary in core Northeast markets and the brand's coffee authority (#1 in the hot drip coffee market supported by espresso, cold brew & frozen coffee) generates a strong emotional connection with the lift of its caffeinated drinks. The brand's coffee value equation includes: bean to grind fresh; brew fresh every time; 18 minute hold time; and free flavor shots. New management leadership (including a CEO with 22 years of experience at McDonald's) is implementing its brand strategy to transform Dunkin' (no longer Dunkin' Donuts) into a beverage-led, On-the-Go brand via: menu simplification & innovation; unparalleled speed & convenience (speed of Dunkin'); the recent launch of national value for the first time; the hiring of an entire new slate of ad agencies; a transformed espresso experience as part of Dunkin's commitment to its beverage-led strategy; digital leadership; and restaurant excellence (restaurant simplification & equipment innovation designed to improve productivity). After a 2017 focus on AM sales (60% to 65% mix), 2018 marketing focuses on driving PM sales. While the AM daypart is a ritual, traffic patterns & consumer behaviors are changing in the afternoon and today’s consumers desire to use Dunkin’ as a quick pit stop for mental/energy breaks (get in, get out & get on your way). The new menu strategy is to: grow & protect the core; expand innovation; create 2nd daypart (afternoon); and drive traffic with value. A long overdue menu simplification makes room for future product innovations, improves service speed & order accuracy and lowers food & labor costs. Also, the brand benefits from its progress on establishing a national value platform which includes the Dunkin' Run $2 snacking menu. Food discounts work well for Dunkin’ as they drive high margin beverage attachments. NextGen new build/remodel image represents a significant improvement, particularly as it relates to incorporating elements that will speed service and facilitate mobile ordering and to-go. While past comps benefited from ritualistic coffee breakfast sales and from industry growth in the breakfast daypart, declining sales growth since 2011 reflects: increasing c-store/QSR coffee competition (discounted coffee used to drive traffic); PM sales softness which may reflect impact of coffee discounting on a less ritualistic daypart & MCD’s breakfast all-day initiative; declining industry breakfast business growth; and cannibalization driven by development in mature markets. Also, Dunkin's value proposition may be undermined by aggressive price increases previously implemented by franchisees. Figuring out value is key as the chain needs strong traffic growth to help build a national footprint (necessary for leveraging national marketing & promotional efficiency) by expanding into new markets that are already well entrenched with local coffee providers. In conclusion, while Dunkin' is strategically moving in the right direction, it is no easy task for the brand to break-through the ongoing coffee value war that impedes the brand's initiatives given the constraint that any effort to reposition to the upside could alienate the brand's core base of middle America.